Diners, Drive-Ins and Dives Open or Closed? 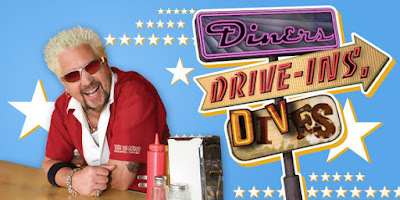 Diners, Drive-Ins and Dives is a food reality television series featuring various diners, drive-in restaurants, and dive bars and is hosted by Guy Fieri. The show is aired on the Food Network channel and each episode has a theme. The show was first aired in 2007 and it is on it's 29th season. For a diners, drive-in restaurants, and dives locations map and to see if they are open or closed, see below. For a larger location map of the diners, drive-in restaurants, and dive bars featured on the show, click here. Dignowity Meats in San Antonio, Texas is open. Zazu Kitchen + Farm in Sebastopol, California is open. Fat Tummy Empanadas in San Antonio, Texas is open. Wrigleyville in San Antonio, Texas is open. Smoke Shack BBQ in San Antonio, Texas is open. The Root Cafe in Little Rock, Arkansas is open. Eight Noodle Shop in Napa, California is open. Cochon Volant BBQ Smoke House in Sonoma, California is open. The Fold: Botanas & Bar in Little Rock, Arkansas is open. Simply Vietnam Express in Santa Rosa, California is open. Zoftig Eatery in Santa Rosa, California is open. Bruno's Little Italy in Little Rock, Arkansas is open. North Bar in Little Rock, Arkansas is open. Storm Castle Cafe in Bozeman, Montana is open. La Terraza Rum Lounge in Little Rock, Arkansas is open. Flyway Brewing in North Little Rock, Arkansas is open. Roost Fried Chicken in Bozeman, Montana is open. Nordic Smoke BBQ in Spokane, Washington is open. Agave in Ashland, Oregon is open. Ruins in Spokane, Washington is open. Bella Luna Cafe in Chicago, Illinois is open. Sun Wah BBQ in Chicago, Illinois is open. Broke Da Mouth Grindz in Kailua-Kona, Hawaii is open. MFK in Chicago, Illinois is open. Blue Toba in Ashland, Oregon is open. Del Seoul in Chicago, Illinois is open. Original Thai in Kailua-Kona, Hawaii is open. Bok A Bok Fried Chicken & Biscuits in Seattle, Washington is open. Piroshki on 3rd in Seattle, Washington is open. Kanaka Kava in Kailua-Kona, Hawaii is open. Manny's Cafeteria and Delicatessen in Chicago, Illinois is open. Saucy Porka in Chicago, Illinois is open. Sisters and Brothers in Seattle, Washington is open. Island Lava Java in Kailua-Kona, Hawaii is open. The Red Door in Seattle, Washington is open. Rebel Kitchen in Kealakekua, Hawaii is open. Grand Harbor in San Francisco, California is open. Scolari's Good Eats in Alameda, California is open. Pizzeria Credo in Seattle, Washington is open. Foster's Kitchen in Kailua-Kona, Hawaii is open. Umekes Fishmarket Bar & Grill in Kailua-Kona, Hawaii is open. Pazzo in San Carlos, California is open. LOBA Restaurant in Miami, Florida is open. Calafia Cafe in Palo Alto, California closed in August 2018 as the costs of running the business were greater than their takings. Sweet n Savory Cafe in Wilmington, North Carolina is open. W.E.P.A.! at Brix 581 in Oakland, California is open. Wood Shop BBQ in Seattle, Washington is open. Cast Iron Kitchen in Wilmington, North Carolina is open. Southern Cafe in Oakland, California is open. Doce Provisions in Miami, Florida is open. Rocco's Little Chicago in Tucson, Arizona is open. Fork-n-Cork in Wilmington, North Carolina is open. Something Fishy Seafood Restaurant in Wilmington, North Carolina is open. The Purple Carrot in Okemos, Michigan is open. Chef Alisah's Restaurant in Tucson, Arizona is open. The Cosmos in Lansing, Michigan is open. Copper Penny in Wilmington, North Carolina is open. Inca's Peruvian Cuisine in Tucson, Arizona is open. Mr. & Mrs. Bun in Miami, Florida is open. Ceviche's in Wilmington, North Carolina is open. Tumerico in Tucson, Arizona is open. CrushCraft Thai Street Eats in Dallas, Texas is open. Milly's Empanada Factory in Miami, Florida is open. Zeman's in Tucson, Arizona is open. Aloha Kitchen in Mesa, Arizona is open. Renee's Organic Oven in Tucson, Arizona is open. Mojo Donuts and Fried Chicken in Miami, Florida is open. Grubstak in Gilbert, Arizona is open. Audrey Jane's Pizza Garage in Boulder, Colorado is open. Whistle Britches in Dallas, Texas is open. The Post Brewing Company in Longmont, Colorado is open. Tacos Chiwas in Phoenix, Arizona is open. Momo Ghar in Columbus, Ohio is open. Tacos Mariachi in Dallas, Texas is open. Zoe Ma Ma in Boulder, Colorado is open. Ena's Caribbean Kitchen in Columbus, Ohio is open. Republica Empanada in Mesa, Arizona is open. Maui Fresh Streatery in Kahului, Hawaii is open. ediBOL in Los Angeles, California is open. Jessy's Tienda y Taqueria in Norfolk, Virginia is open. Alkaline in Norfolk, Virginia is open. Pendulum Fine Meats in Norfolk, Virginia is open. Brigit & Bernard's Garden Cafe in Kahului, Hawaii is open. Eveready Diner in Hyde Park, New York is open. Leo's BBQ in Oklahoma City, Oklahoma is open. A1 Diner in Gardiner, Maine is open. Baby Blues BBQ in Venice, California is open. Louie Mueller Barbecue in Taylor, Texas is open. Bar-B-Q King in Charlotte, North Carolina is open. Frank's Diner in Kenosha, Wisconsin is open. Gaffey Street Diner in San Pedro, California is open. The Coffee Cup in Boulder City, Nevada is open. Patrick's Roadhouse in Santa Monica, California is open. Frosted Mug in Alsip, Illinois closed in March 2008 and was for sale for 5 years. It reopened as Demon Dawgs in 2014, they closed in July 2017. The Penguin in Charlotte, North Carolina closed in February 2015 after the owner declared bankruptcy. Comida opened in it's place. Pizza Palace in Knoxville, Tennessee is open. Hullabaloo Diner in Wellborn, Texas is open. Four Kegs Sports Pub in Las Vegas, Nevada is open. Mac & Ernie's in Tarpley, Texas is open. Brint's Diner in Wichita, Kansas closed in June 2018. The diner had changed hands twice since the show. Mad Greek's Diner in Baker, California is open.